Hello and welcome to the Camp McNeill All-Volunteer Cub Scout Camp Staff. Join your fellow Scouts as we work together to develop a high quality staff to deliver a top-notch program for our Cub Scouts. With a great camp program and positive staff, we can keep our Cub Scouts in Scouting longer and grow them into service-minded Boy Scouts. Being a member of our staff means that Scouts will earn service hours towards rank advancement, take a leadership role, and learn what it takes to deliver a high quality camp program. 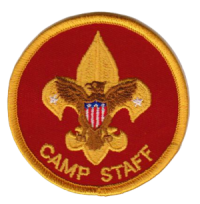 Scouts that serve on Camp McNeill staff for 4 out of the 6 weekends of Fall Family Camp (FFC) or Cub Scout Resident Camp (CSRC) along with one of their Unit Leaders, can earn a $100 discount to attend Summer Camp at Camp Bowers. In addition to the above opportunities, each staff member will receive an exclusive t-shirt and a camp patch as keepsakes for their time spent at Camp McNeill. We have 2 options to register for Cub Scout Resident Camp this Spring – Sign up as an individual, or Register your whole Troop to help serve a weekend (or all 3) at Camp Cub Scout Resident Camp.